Late Victorian mahogany washstand from the Commander's cabin of the HMS Mohawk (marked to back). This ship was in military service 1890-1905 seeing much history during this time. Crafted in solid mahogany with all original interior fittings. Top door folds down to reveal a brass lined lid with copper sink and bottle holders. A large copper reservoir and a water carrier are fitted in cupboard inside bottom door. These would have been used to deliver and empty washing water. All parts are fitted to stay in place while at sea, and it is unusual that they have not been separated, as they are beautiful and valuable in themselves. The two knobs are brass having a beautiful patina, and there are two pierced cast brass vents to the sides. The ship was a twin screw cruiser, 3rd class, with a complement of 172. She was armed with 6x6 inch guns, 8x3 pounders and 3 torpedo tubes. In 1890 she was based in Sheerness, having just been built, but later served on the South Atlantic, Mediterranean, Australian, China, and East Indies stations. Commander E.H. Bayly took command 04/08/91. Size 49.5 inches high by 8.5 inches deep (closed), or 24 inches deep with sink open, by 22.5 inches wide. 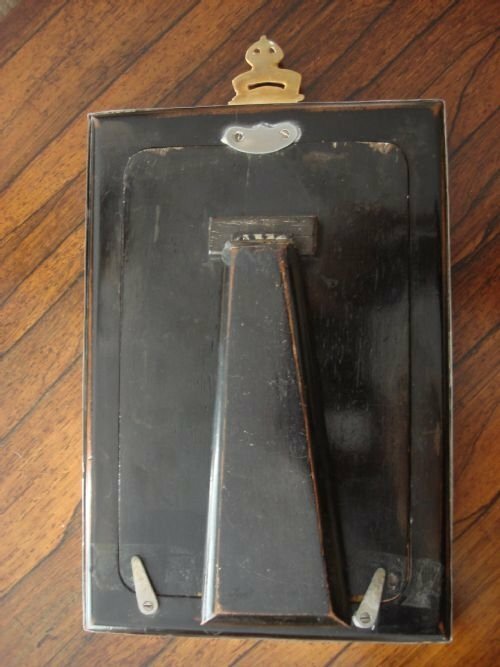 Wonderful collectable item for the collector of marine antiques, or anyone with interest in unique pieces. A rare piece of history in very good condition. Wonderful Birmingham 1901 solid silver mounted military Calvary officers pouch from the first year of the reign of King Edward VII. 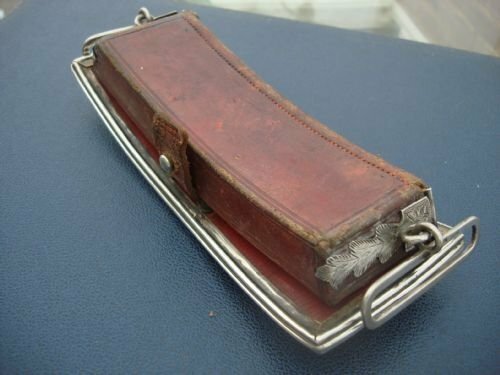 Edwardian Birmingham 1901 marked English hallmarked solid silver mounted leather military Calvary officer's pouch featuring the elaborately scrolled gilt metal cypher of King Edward VII. The King's applied cypher ER (Edward Rex) VII is surmounted by his crown. He reigned as the King of England from 1901-1910. This was made in the first year of his reign, the same year that the former monarch, Queen Victoria, died. 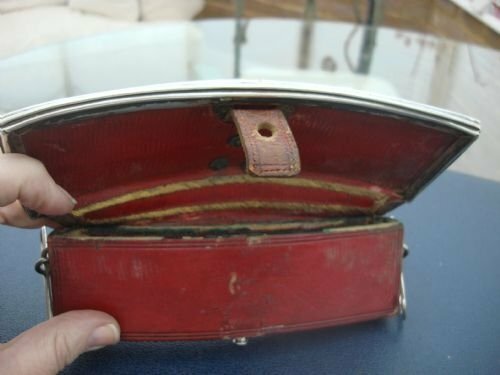 This pouch would have been worn by the Calvary officer on a crossbelt, and although its use was mainly ornamental, it was designed to hold pistol ammunition. 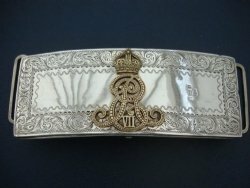 The solid silver mounts were made by Bent and Parker of Birmingham, makers of military pouch mounts and ornaments, and bear their sponsor's mark. All the beautiful silver mounts are fully hallmarked and deeply engraved with scrolls and leaves. The silver belt loops, having decorated silver leaf bases, are attached to the sides of the leather pouch. The loops are meant to slide on to the belt. The pouch is made of red Morrocan leather and embroidered with gold bullion wire both inside and out. It is curved to fit the contour of the body. Size-7 3/8 inches long by 2.75 inches wide, not including belt loops. 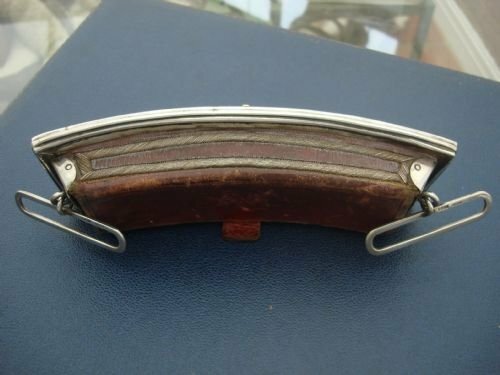 This is a wonderful piece of British military history, and is unusual to find, particularly in this condition. 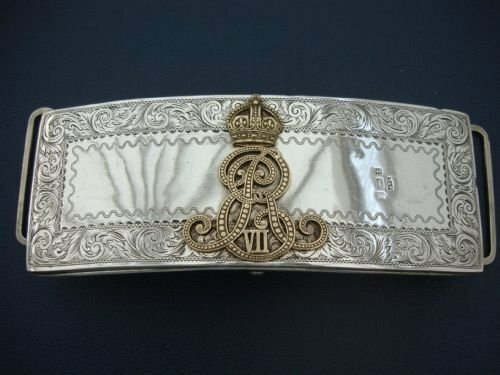 It is from a time when such items were made in solid silver, which would have been expensive, and only worn by an officer. In very good condition, this is a great item for someone interested in military history, or the collector of unusual solid silver pieces. 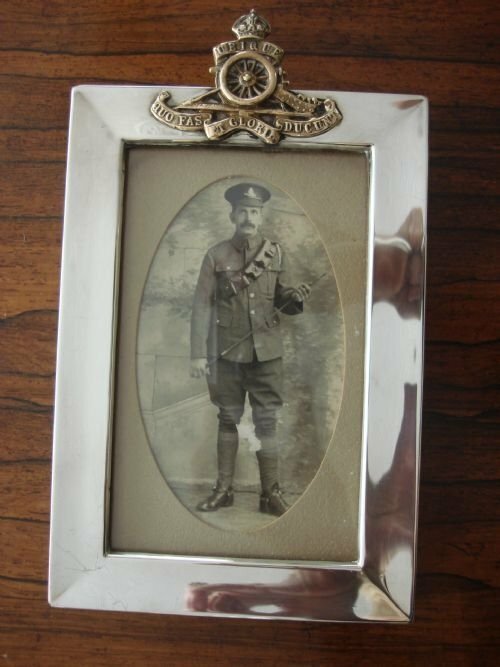 Birmingham 1909 solid silver photograph frame with Royal Artillery military interest, by famed makers SAMPSON MORDAN AND COMPANY. 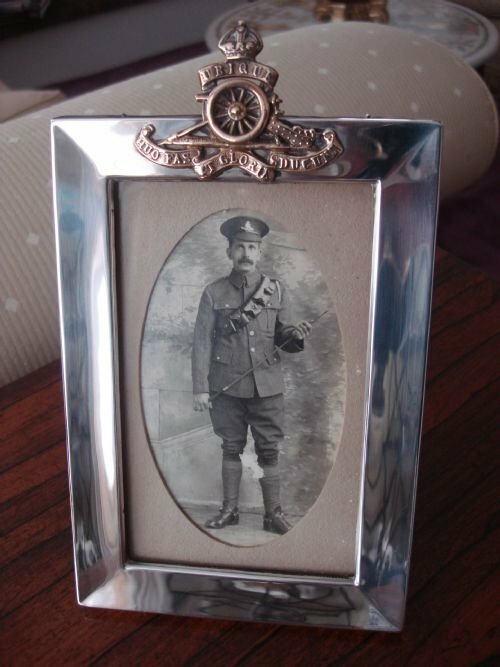 Birmingham 1909 English hallmarked solid silver lovely glazed photograph frame by famed makers Sampson Mordan and Co, and having the original solid wood back and easel stand. The lovely frame is surmounted with a Royal Artillery Regiment brass cap badge, and the frame contains the photo of the unknown owner wearing the full uniform with cap. This may possibly have been made bespoke to memorialise him after his death in service. 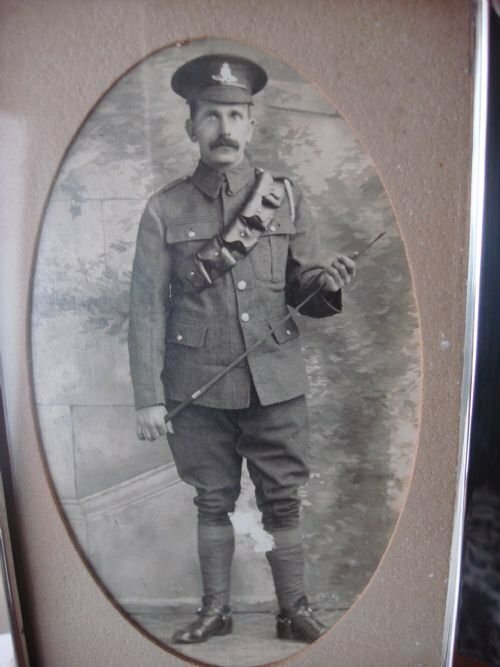 With the assistance of the Royal Artillery Library, I have discovered that this gentleman was a member of the Royal Regiment of Artillery, and from the spurs, bandolier and crop he would have served as a Driver. The Driver was a soldier trained in the management and use of horses, one of the most important functions in the battery. At the time this photo would have been taken, the regiment was larger than the Royal Navy, and he would have likely been serving in India. The badge depicts the Royal arms and supporters with a cannon and the motto in Latin which translates to "Everywhere Whither Right and Glory Lead." The gun depicted on the cap badge is a 9pdr Rifled Muzzle Loader of about 1871, and the rammer used to ram the charge into the muzzle is also seen, to the left of the carriage wheel. This style of the uniform was only used from 1908-1924, which fits with the date of the frame. Lovely on its own, the frame becomes even more interesting with the provenance and photo. This frame is in very good condition, and made by a much sought after maker. 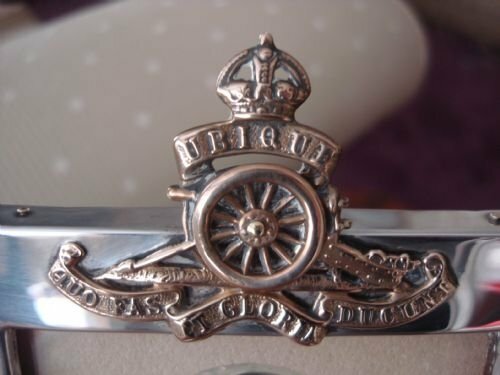 It would appeal to collectors of militaria as well as silver collectors. 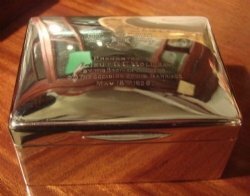 London 1920 solid silver fine quality box by Joseph Braham with interesting 12th County of London Batallion, The Rangers, inscription and history. 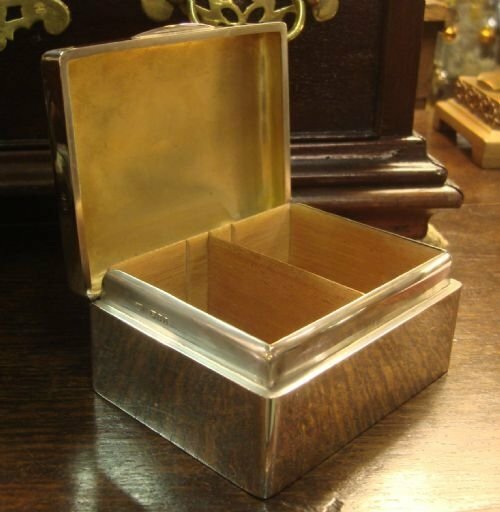 London 1920 English hallmarked solid silver box with cedar lining and movable divider, made in a heavy gauge of silver and having slightly domed top and rounded corners. Made by Joseph Braham. This box was given in 1929 to Lieutenant G. C. Holliday upon the occasion of his marriage, by his fellow officers in the 12th County of London Battalion, The Rangers. The lid bears the colours and major campaigns of The Rangers, and the personal inscription. The underside of the base is leather. 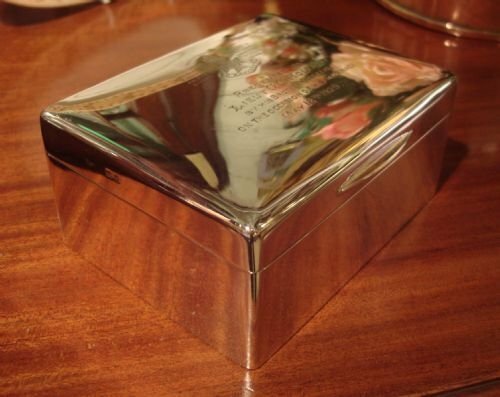 The lid interior is silver gilt. Size-4.5 inches long by 3.5 inches wide, by 2.25 inches high. This was given the year of the Stock Crash, and the advent of the depression, and would have been expensive. Lieutenant Holliday must have been held in great esteem by his fellow officers. 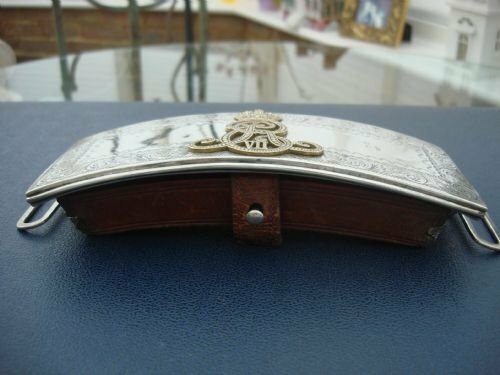 This is a fine quality box, probably originally made for cigarettes or small cigars, but also very suitable for dressing table or desk, or for the collector of military memorabilia. In very good condition, and a much better shape, size and quality than most. WWI, dated 1917 Verners Pattern MKVIII military hand bearing prismatic officer's marching compass. Patented by noted military surveyor Captain Verner, a hand bearing 1917 prismatic officer's marching compass in original unpolished condition, with mainly intact original paint and gilding. Mother of pearl dial for low light reading. A good very strong hinge and catch. Front sight in hinged lid, while rear site hinges up from catch. Floats well when transit clamp is released. Military broad arrow ordinance mark to back. Verners Pattern marked to left of front catch, with VIII marked to the right. Flaw in glass to underside edge of interior glass dial cover, which cannot be felt, but is just to the right of the catch in photo, and seen only when cover is up. This compass has been used by the military for generations, and was so valuable it was required to be returned upon leaving the service.